Can You Get an Executive MBA Online? For busy business professionals who lack the time to complete traditional full-time graduate programs, choosing to get an Executive MBA online can be wise. Online EMBA programs are becoming very popular for working managers, entrepreneurs, and other business leaders to bolster their skills without disrupting their successful careers, according to US News and World Report. Using cutting-edge technology, online Executive MBA programs create an interactive virtual classroom for graduate students to learn new business strategies and share their experiences. Most EMBA degrees require at least five years of experience, because the curriculum is designed for mid-career professionals needing to brush up on knowledge they’ve already acquired. Let’s take a closer look to determine if getting an online Executive MBA is right for you. Flexibility is the biggest advantage that comes from studying business online. EMBA programs online will require little to no campus residency requirements. Full-time working adults won’t have to waste time commuting, waiting for professors, or sitting in a college classroom. Course materials can be accessed via the Internet 24/7 to accommodate any hectic work schedule. Executives can work on their online MBA assignments during their lunch break or after hours. Online Executive MBA programs are typically more affordable than traditional ones because there’s no need to afford room and board, extra transportation, meal plans, and childcare. Many employers will even provide tuition assistance. You’ll only need a computer and viable Internet connection to embark on self-paced professional development. Although the curriculum can vary greatly from university to university, most online Executive MBA programs can be completed in two years or less. Courses will draw on managers’ current knowledge to facilitate better ethical leadership in the 21st century. Along with conventional lectures, the online EMBA will likely include discussions, team projects, consulting work, video conferencing, and applied practice. 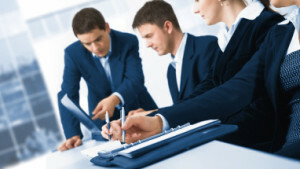 Based on their unique career goals, executives may be able to specialize in certain disciplines, such as Accounting, Marketing, Operations Management, Finance, or Information Systems. Some programs may build global awareness by requiring a short-term immersive study abroad trip. Online EMBA curricula strives to build the managerial skills needed to resolve today’s key business issues. Choosing the right online Executive MBA is a decision that shouldn’t be taken lightly. As the popularity of online education has grown, so has the number of scams. Make certain you’re avoiding the so-called diploma mills by only considering online EMBA programs from regionally accredited institutions. The most prestigious degrees will also have elite approval from the AACSB International or ACBSP. Peruse the rankings published by the U.S. News and World Report, Bloomberg BusinessWeek, Forbes, and Financial Times to find schools offering high-quality MBA education. Other important factors you should consider include tuition costs, faculty credentials, learning opportunities, areas of specialization, online technical support, student engagement, and job placement rates. Overall, online Executive MBA programs can be a smart investment for rising business leaders seeking an added competitive edge through advanced education from anywhere at any time. According to a survey from the Executive MBA Council, graduates increase their salary by 14 percent on average. Many can advance towards becoming a chief executive and bringing home over $180,000 annually. When you choose to get an Executive MBA online, you’ll have the valuable opportunity to maximize your strategic know-how and network of contacts without putting your career on the back burner.